Sense/work with subtle energies, including your own, crystals and those of the world around you. Partner with crystals, plants and other living energies of Nature more consciously and co-creatively. Work with energetic self-care practices to support health and well-being, clarity and focus, intuition and creativity, deeper understanding of self and spiritual essence. Partner with crystals in working with other energy modalities such as Reiki and Feng Shui, and practices such as grounding and meditation. Create healthy, nourishing environments that provide greater support, comfort and sense of well-being. Includes stone families recognized for their particular gifts in healing, growth and well-being. Maintains stones in a clean, highly-refined and vibrant state, ready to partner with you in self-care, healing, personal growth and nurturing your environment. 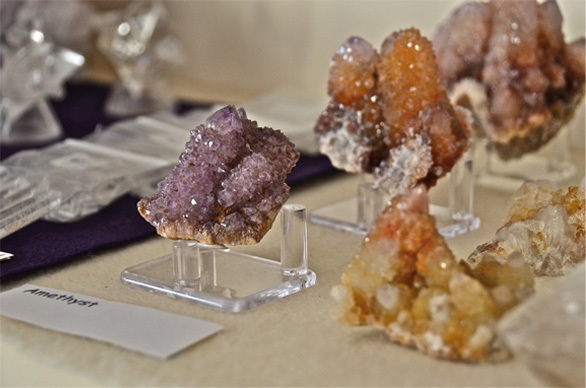 Is available to clients and students who would like to purchase crystals whenever they are at The Crystal Bee for an appointment or class. We view human beings as human energy beings who are members of the world of living energies in which every living being expresses energetically and experiences the energies of others in dynamic interaction. We recognize each person’s natural intuitive gifts and healing abilities, and potential to direct them to attaining higher states of health, well-being and spiritual growth. We honor the living energies of Nature and their wisdom, generosity and healing gifts. We recognize the importance of co-creative relationships between Nature and human beings, and the reciprocity of these relationships. We honor each client’s stated intentions and choices as the energies that direct our work together. We value an integrated approach that recognizes the dynamic nature of growth and healing, and honors the gifts of both traditional and complementary healing traditions. We value and honor the partnerships between individuals and the healing professionals with whom they work.